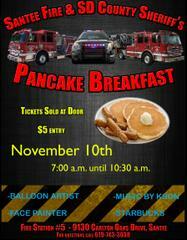 The Santee Sheriff's Station and the Santee Fire Department are teaming up for the Santee Pancake Breakfast. 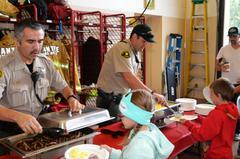 The entire family can enjoy a delicious breakfast cooked up by deputies and firefighters. The menu includes pancakes, eggs, sausage, coffee and juice. While enjoying breakfast, the public can spend time and get to know their deputies and firefighters. 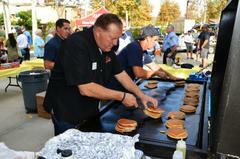 The Santee Pancake Breakfast is a fun way of bringing the entire community together. Breakfast is $5. Money raised from this year's event will benefit families in need in the Santee area. For more information on the Santee Pancake Breakfast, call the Santee Sheriff's Station at (619) 956-4000 or the Santee Fire Department at (619) 743-3038.